The first quarter of 2016 has been pretty volatile for oil benchmarks. 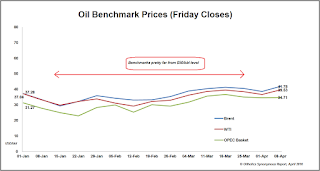 Yet if you iron out the relative daily ups and downs in percentage terms, both global benchmarks and the OPEC basket are marginally higher than early January (see chart left, click to enlarge). Brent, at $37.28 per barrel back then, ended Friday trading at $41.78, while WTI ended at $39.53, up from $37.04 in early January. 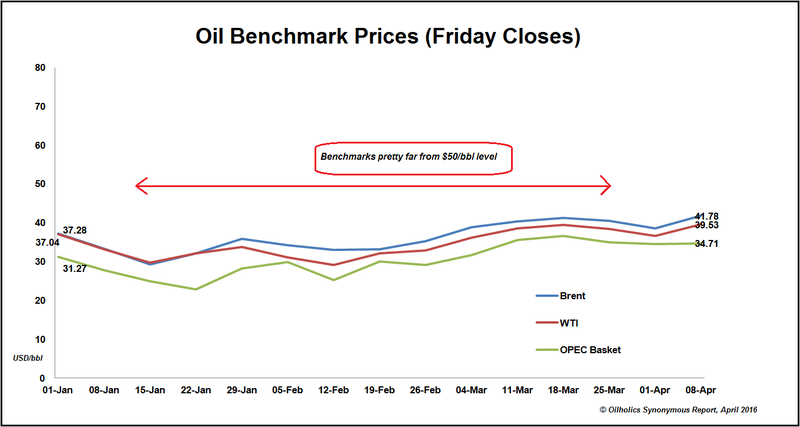 That’s a fairly flat outcome following the end of a three-month period, but in line with the Oilholic’s conjecture of an initial slow creep above $40 per barrel by June, followed by yet another crawl up to $50 per barrel (or thereabout) by Christmas (as the Oilholic opined on Forbes). Moving on from pricing matters, a new report from GlobalData suggests crude refining capacity is set to increase worldwide from 96.2 million bpd in 2015 to 118.1 million bpd by 2020, registering a total growth of 18.5%. In line with market expectations, the research and consulting firm agrees that global growth will be led by China and Southeast Asia. A total of $170 billion is expected to be spent in Asia alone to increase capacity by around 9 million bpd over the next four years, GlobalData added. Matthew Jurecky, Head of Oil & Gas Research at the firm said: “The global refining landscape continues its shift eastwards; 40% of global refining capacity is projected to be in Asia by 2020, up from around 30% in 2010. In Europe, growth is expected to occur at a substantially slower rate. Although demand is decreasing and is less competitive, older refineries in Western Europe are being closed, these factors are being countered by investment in geographically advantaged and resource-rich Russia, which sees Europe’s capacity increasing marginally from 21.7 million bpd in 2015 to 22.5 million bpd by 2020. Away the refining world to the integrated majors, with a few noteworthy ratings actions to report – Moody’s has downgraded Royal Dutch Shell to Aa2 with a negative outlook, Chevron to Aa2 with a stable outlook, Total to Aa3 with a stable outlook and reaffirmed BP at A2 with a positive outlook. Separately, Fitch Ratings has affirmed Halliburton at A-, with the oilfield services firm’s outlook revised to negative. That’s all for the moment folks, keep reading, keep it crude!